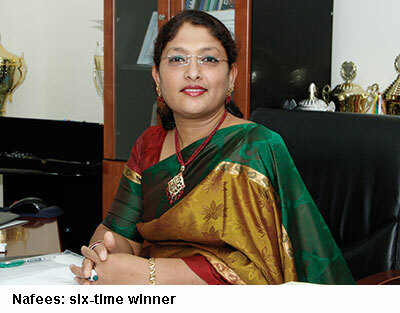 Asna Nafees is principal of the Delhi Public School-Modern Indian School (DPS-MIS), Doha (Qatar) — a franchisee of the Delhi-based Delhi Public Schools Society which runs one of India’s most successful K-12 school chains. The CBSE-affiliated DPS-MIS (estb.2001) has 5,700 students mentored by 320 teachers on its muster rolls. Nafees, who took charge of DPS-MIS in 2011, is also an active member-coordinator of the CBSE Gulf Council/Sahodaya, an association of 174 CBSE-affiliated schools in the Gulf region. Since 2012-13, for six consecutive years, as principal of this top-rated school, she has been conferred the Gulf Council Award for academic excellence. She has also been commended by CBSE and the Union HRD ministry, for her initiatives in inclusive education. Newspeg. Nafees was in Bangalore in January for a four-day CBSE Principals’ Conference which attracted 130 principals from Gulf region schools. She was invited as speaker in a panel which discussed ‘Our Children Deserve More’. The CBSE Gulf Council has chapters in six countries of the Middle East — Bahrain, Kuwait, Saudi Arabia, Sultanate of Oman, State of Qatar, and the United Arab Emirates — which conduct the council’s annual conference in member countries by rotation. Since Qatar, which was scheduled to host the conference this year is subject to an economic blockade by Saudi Arabia, the venue was shifted to Bangalore. History. The CBSE Gulf Council was established in 1988 with the objective of connecting principals of CBSE schools in the Gulf region and keeping them abreast of the latest policies and initiatives of India’s premier national school-leaving examinations board. Direct talk. “A successful school may not be a happy school but a happy school is always successful. The time has come for school leaders world over to reflect on ways and means to develop genuine love of learning, and discover and nurture the multiple and special intelligences of children. Every child deserves not only the right to education, but the right to a happy holistic education. This was the consensus of the panel discussion in which I participated,” says Nafees, an education and life sciences alumna of Andhra, Osmania and IGNOU universities with over two decades of teaching and administrative experience in reputed secondary and higher secondary schools in Kerala, Tamil Nadu and the Gulf. Future plans. Enthused by the sustained academic excellence of DPS-MIS students and letters of commendation issued to her by CBSE and the Union HRD ministry, Nafees has drawn up plans to introduce maximum student diversity in her awards-winning school. “Right now, my focus is to make my happy school more accessible to children with special needs by creating conducive learning environments for them. I am also committed to raising awareness in the Gulf region of the innate and largely undiscovered potential of challenged children,” she says.